"Americans Oblivious to the Approaching Storm"
A while back we attended an evening meeting of over 30 rural landowners, in which a couple of auditors of a land use department were there to collect stories of government abuse, for the purposes of an audit. They got an un-expected ear full. As the two auditors were leaving the meeting, one of them was overheard to say, "I had no idea it was this bad." One might ask how they could be so blind when the rural landowners of this county had been yelling from the rooftops for years, about the egregious injustices that are being foisted on them by an over-bloated, CITY-RUN, county council. In the spirit of surprising civilized behavior, one by one, the landowner's stories came pouring out, sometimes punctuated with a few expletives, sometimes with passion bordering on wanting to do physical harm to the perpetrators of their extended grief. Words like Gestapo, brown shirts, Nazism, communism and socialism were frequently on the lips of the landowners, as they related their individual experiences with land use code enforcement officers. But what was entirely overlooked by those attending the meeting and by the auditors themselves, was that this was just a symptom of a much greater evil, an evil that is being perpetrated on an American minority, with little or no representation in the government process. An evil that is foisted on this minority by the tyranny of a majority (city folk) who have bought into the "green" lie that the environment must be protected, no matter how much it costs, or how many individual and property rights that the minority has to give up to implement what can be generously called, a draconian, environmental government policy. This evil has all the characteristics of mass or religious hysteria. It is an evil that totally ignores the rights protected by the 5th Amendment to our cherished Constitution, the absolute requirement by government to provide "due process" and "just compensation" when "TAKING" private property. It is also an evil that violates another section of our Constitution, the "equal protection clause". The rural minority is being asked to bear almost the entire burden of environmental protection, for the benefit of the constitutionally ignorant and naive urban dwellers, who have been duped into thinking they have the right to usurp the property rights of their rural brethren with their votes. But all this grief being dumped on rural landowners is coming from the top down. It comes out of a spineless U. S. Congress that daily violates their oath of office to preserve, protect and defend the Constitution of the United States. It comes from wealthy environmental groups. It comes from Europe and the United Nations with their fully expressed goal to take the land away from private citizens in America. It is formal UN policy that: "Private land ownership is a principal instrument of accumulation and concentration of wealth and therefore contributes to social injustice.... Public ownership of land and public control of land use is therefore indispensable." Think Agenda 21. America is a member of the United Nations and has ratified many of their social and environmental goals by executive order and Congressional legislation. Even one of the U. S. Supreme Court justices (Ginsberg) outrageously believes that we must look at European laws and statutes, when adjudicating American law or legislation. These national and international injustices are further extended into state and then local governments, as it filters down from the UN, the President (Executive Orders) and the Congress that pass "green" legislation that fully violates the Constitution, if not putting at risk our very liberty. Trump has reversed many of these trickle-down laws and rules, but there are so many of them. He can only put a small dent in this tangled web of government tyranny by rule of law. But let's be frank here. Let's say what many think, but don't have the courage to say. Had federal, state or local governments done what they are now doing to the rural minority 100 years ago, the guns would have come out and some government officials would be either shot, hung, or tarred and feathered. As a matter of fact, such things did happen over 100 years ago, when rural landowners wouldn't bow down to anyone, but especially they wouldn't bow down to government officials, politicians and bureaucrats alike, who would trespass on their rights, or their land. In spite of this past history, we still abhor violence and do not condone it, knowing full well that it just leads to more violence. We can win without violence, but we will only win when enough Americans decide that freedom is more important than their pleasure, or their assets. With government holding all the political power, all the money (our money that they use against us) and an enforcement arm (police) that will take on the people with guns, but shield the politicians and the bureaucrats from the people, our task is formidable. That is why you see armed and uniformed police officers at almost every public meeting these days, in every small and large corner of America, to protect the politicians from the anger of the people. They fear us, but they don't fear us enough. Unfortunately, today, the fight has gone out of the people. They want to be civilized, they want to be nice and avoid a fight. Sadly, being nice just enables government to do more against us. After all, if the people fought they might endanger some of their creature comforts. So the job is left to the few of us who have the courage to stick our heads up above the noise level and call tyranny what it is, tyranny. The hard truth is, that if those of us who are fighting are left to our own resources to take on the almighty government, we will eventually be crushed. (i.e. Bundy, Hammond, Nettleton, Hage, etc.) If they could crush us now, they would, but so far we still have the right of free speech and we can still call out government injustices and rising tyranny. But if government can take away one right, which they have, they certainly have the power to take away our other rights whether urban or rural. If left alone, where the people do not hold government to its constitutional limits, the rest of our constitutional rights are headed for the garbage dump. But then hey, it's your freedom to preserve, protect and defend, or not. What you do, or don't do, will have lasting affect on your children and grandchildren. We can certainly understand your desire to be civilized and be nice, so as not to put at risk your hard-won creature comforts but it won't save liberty. Just so long as you have your car, your boat, your home, your job and your vacations, it would be foolish on your part to make waves. Right? After all, let the other guy take the heat, why should you? That's exactly what the German people did during the rise of Hitler. Sure we could use your HELP, but after eleven years in the heat of this battle we know that we, like so many of us who really care about America, are mostly left to fight Goliath on our own. That is especially true of the rural landowner who is besieged by a constant barrage of new land use and environmental laws about which the landowner knows nothing until he gets a notice of violation in the mail, or some drunk-with-power code enforcement officer knocks on his door. Please consider this information as a public service notice regarding powerful new information about the rights of rural landowners to exclude anyone from their property, including government agents and law enforcement. Our organization receives many complaints from landowners, all across America, saying that government and law enforcement believe they have the right to come on your property any time they feel like it under federal, state, or local law and unfortunately they do. But you can revoke that law. Allow us to explain. 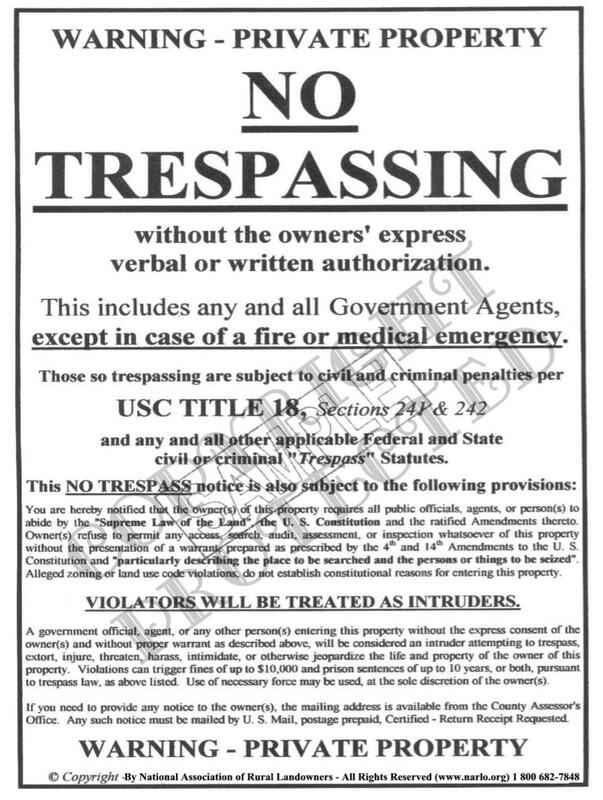 The right to legally trespass on property by law enforcement and government agents is supported by the "knock and talk" implied license, as set forth in precedent law by U. S. Supreme Court cases, Breard v. Alexander 341 U. S. 622 (1951) and Florida v. Jardines 133 S. CT 1409 (2013). However, under a 10th Circuit case C:13-CR-00006-RAW-2 (2016) legal authority was granted to the property owner the right to REVOKE that implied license by proper signage. In our stated goal of acting as advocates for rural landowners, NARLO has developed a copyrighted, powerful "REVOCATION OF IMPLIED LICENSE" No Trespass sign that provides notice to government and law enforcement that the "Implied License" under the U. S. Supreme Court cases cited above, has been revoked by the landowner. Please note that federal law has priority over state and local law. Our new sign is a powerful companion to NARLO's large 18" x 24" "No Trespassing sign" and is purposely designed to be mounted above the large sign, or the new sign can stand alone on its own. There is no other sign this powerful in keeping government agents and law enforcement off your property, anywhere on the market, backed up by the law. Take a look at our copyrighted "Revocation" No Trespass sign HERE. Landowners must organize: If landowners really want to fight back when government comes calling with an unconstitutional land use fine or notice of violation, they must form a group of rural landowners and start a "NARLO County Chapter" in their state, like the landowners in Garfield County, Utah did. Be sure and share this information with your rural friends. They need to know. Remember! It's the rural landowner that provides the food you eat. If government can take away the rights of rural landowners, they can just as easily take away the rights of those who live in cities. Government has and is, but the city dweller is unaware of what is going on behind their backs. If city dwellers buy into radical environmentalism (climate change, etc.) and the social justice propaganda being fed to the American people every day from government and in our schools, our colleges and in the news media, they will literally be committing American liberty and sovereignty suicide. Unfortunately, tens of millions of city dwellers have been drinking the government Kool-Aid and have been converted to hopelessly naive' socialists. The city vote has virtually destroyed any semblance of constitutional law in America and city dwellers are totally unaware of the approaching storm they've created. America is bankrupt. Congress is impotent. The courts are a stacked deck. The borders are more than porous. Civic violence and crime are increasing. Terrorists will continue to attack us. Our schools and colleges are indoctrination centers and the people are losing their honor, integrity and morality in exchange for drugs, pleasure and entertainment. To peacefully restore our Constitutional Republic, if it can even be restored, will take the combined, dedicated and coordinated efforts of millions of Americans who still cherish freedom. In the end, it may take guns.